We’ve been busily working around the clock for the past few months converting the 3D printed T8 robot prototype into the next generation injection molded, consumer version, T8X. 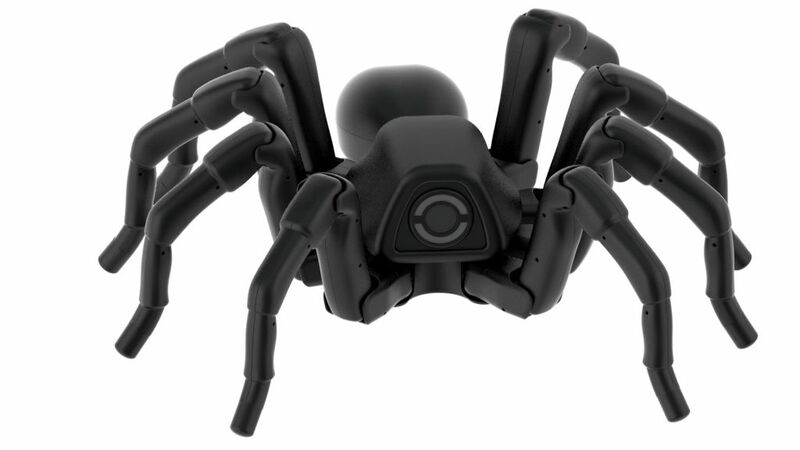 Not only does this conversion make the robot much more affordable for everyone, but we’re also using this opportunity to add more features to it, making it smarter, more user friendly and customizable. The top cover can be easily removed by simply pushing open a snap-fit feature located behind the head, giving easy access to the payload area. The robot has a main motherboard which handles all the background robotics algorithms (the Bigfoot™ Robotics Engine) and a separate user programmable daughter board to handle the higher level commands to tell the robot what to do. This daughterboard can be set to run custom sequences created by the user or those created by other users who are sharing their scripts within the Robugtix community. Once the product is ready to ship, a Robugtix community website will be created as a meeting place for Robugtix customers and T8/T8X fans, to share their cool ideas, scripts and customization projects with each other and with the world. The slots on the left and right side of the robot allow a velcro strap to wrap around and hold the battery in place. This means that any size and shape battery pack can be used. A single 4.8V NiMH battery pack will be included with the robot. Connecting the power adapter (also included) to the robot will recharge the NiMH battery. The built-in battery charger can only be used to recharge NiMH type batteries. Why NiMH batteries only? The explanation is at the end of this blog post. The on/off switch and power adapter jack is located on the front lower side of the robot. 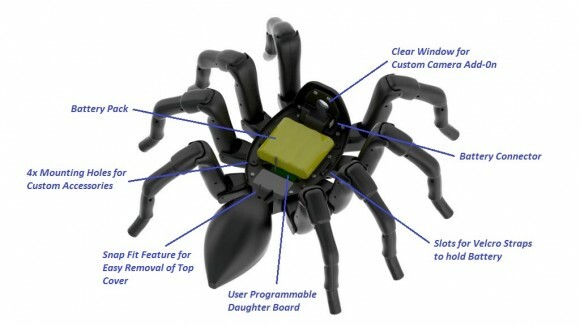 A clear window for the “eye” of the robot lets users add their own little camera inside the robot to record the world as seen from the robot’s perspective. 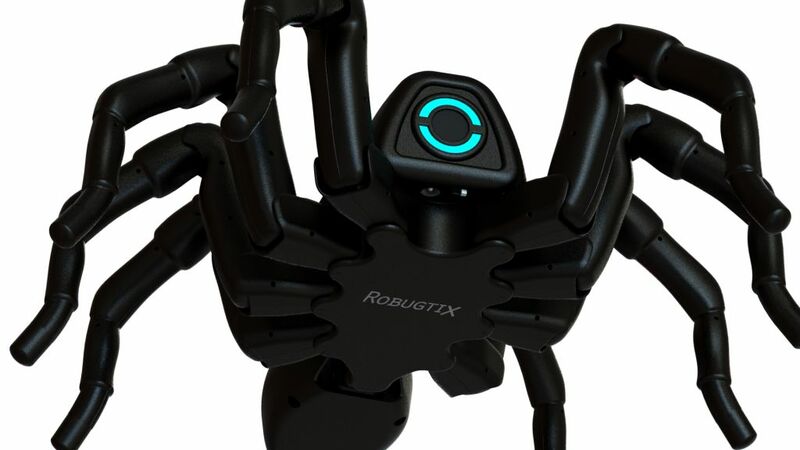 In the future, an official Robugtix camera accessory may be available at our online store for users to get that awesome first person spider view of the world. Finally, there are 4 mounting holes located on the inside of the robot for users who may want to customize it further with additional sensors. Going back to explaining why NiMH batteries are being used… we are only supporting NiMH batteries at this moment due to air shipping regulations. Nickel type batteries, such as the NiMH are considered relatively safe for air shipping around the world. Lithium type batteries, on the other hand, are a different story when it comes to air shipping safety. A LiPo battery that short circuits or gets wet can catch fire and explode, making it difficult for us to create a LiPo based product that directly ships internationally from our facilities in Hong Kong to your location. The main advantage of using Lithium type batteries instead of Nickel batteries is the lighter weight. While it is still possible to power the robot with a light weight LiPo battery (after making sure it meets the voltage requirements of the robot) recharging with the built-in charger must not be allowed to occur under these circumstances (do not plug in the power adapter into the T8X robot if a LiPo battery is connected to the T8X). The built-in battery charger inside the T8X was designed to safely and efficiently recharge NiMH batteries only. Using the built-in NiMH charger to charge a LiPo battery is dangerous so a separate LiPo compatible external charger must be used instead. Safety is our top priority, so unless there is a special research purpose requirement, we recommend that you stick to NiMH batteries on the T8X to avoid possible accidents. Warranty will be voided if battery types other than NiMH are used. The images included in this blog post are computer rendered and are not actual photographs of the product yet. The molds for this product are being made at the manufacturing facility at this time. Moldmaking is a careful, part art, part science (mostly science), process that takes on average, 2 months, and sometimes additional mold iterations are done to increase the accuracy further. So these renderings are sneak peek images of what to expect. Once the molds are finished and the first few units are in our hands, new videos will be out and the products will come off the manufacturing and assembly line at blazing speeds. In future blog updates, we will show the other aspects of the robot, such as controlling the robot with our new controller software (yes, another sneak peek blog will be available soon), and how to program custom sequences. Stay tuned!